While not directly related to genetics, this is an excellent example of well-designed data representation. 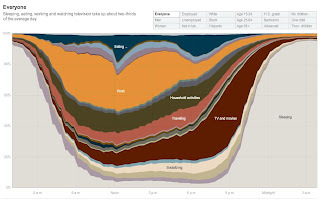 The New York Times reports the results of a survey of average time spent on various activities through the day by different groups of people. Nice graph. Amazing how TV eats up almost as much time as work.